Sukanya Verma doesn't know about you, but she is seasick of it all. 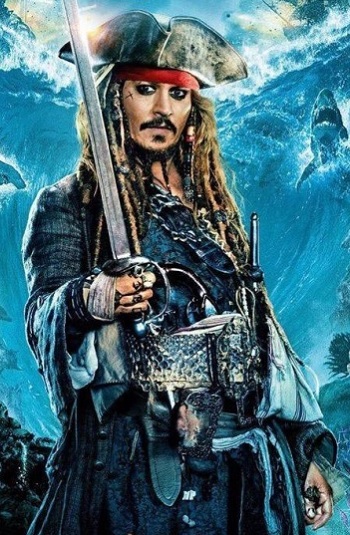 I enjoyed the The Curse of the Black Pearl, went along with Dead Man's Chest, still shudder at the memory of At The World's End and have no memory of On Stranger Tides. After a point, the Pirates of the Caribbean franchise became so bloated and interchangeable, it became hard to tell one apart from another. In its nearly decade-and-a-half stint, Jack Sparrow's rum-swigging, goofball pirate has gone from subversive to stereotype and many characters have died and been resurrected. Mostly though, the bar's slipped so low that even 'decent' seems like a significant upgrade from status quo. So that's what Salazar's Revenge (released as Dead Men Tell No Tales in the US) is then, readers, one of the better sequels of the film that landed Johnny Depp his first Oscar nomination. It doesn't have the edge. It doesn't have the cunning. But the fifth one's jaunty tone and overpowering regard for silliness keeps the tempo going through its relentless course of 132 minutes. Directed by Norwegian duo Joachim Rønning and Espen Sandberg (of Kon-Tiki fame), Salazar's Revenge is a typical rigmarole of escape, vendetta and quests that take off after Will Turner's son (Brenton Thwaites) bids to procure the powerful Trident of Poseidon and lift a curse off daddy dearest, one that forces Orlando Bloom to cover a good deal of his pretty mug in barnacle that looks like bubble wrap mixed with smashed peas. On the other hand, Salazar (Javier Bardem), a livid, squid-ink slobbering, pale-faced, partially putrefied Spaniard -- resembling a creepy hybrid of The Crow and Gollum -- and his dismembered, wraithlike crew are after Jack Sparrow's head as payback for their undead condition. Who better than resident double-dealer Barbossa (Geoffrey Rush) to get the job done? Amidst these hellish sights, there's the gutsy astronomer Carina (Kaya Scodelario) branded a witch by chumps who hang signs like 'No Dogs. No Woman' outside their door. What's infuriating about this so-called strong female narrative is how deceptive it is. The film first goes overboard to assert Carina's independence and intelligence only to grab the first lowbrow pun (ha ha, horologist, anyone?) it can find to attack those very cherished beliefs. Ultimately though, it all boils down to where the franchise's only attraction wants to compass his stale new adventure. Stagy as ever, Sparrow (Depp) makes his entry inside a vault, drunk and campy if also jaded and overfamiliar -- what ensues is a madcap bank robbery sequence. The guillotine-themed romp to precede it endears you by the sheer foolhardiness of it all. There's a cartoonish rhythm to these action pieces that previous Pirates of the Caribbean films completely abandoned in favour of perfunctory blockbuster diktats. When a fight breaks out between Salazar's sword-wielding stiffs and Sparrow's swashbuckling mateys, a lifeless figure at the anterior end goes hostile in a manner that would meet visual effects legend Ray Harryhausen's approval. There's some wonder and thrill in its extensive escapades and combats befitting of its amusement park origins. But there's also a premature cashing in of nostalgia through reunions that don't feel as overdue or emotional as the makers would like you to believe. There's repetition by way of heroes with no new tricks in their bag and villains trapped in one-dimensional menace. There's Disney's overused gimmick of digitally de-aged actors as well as daddy issues that render one of its crucial characters a Yondu-like fate, which wouldn't feel this banal if Guardians of the Galaxy 2 hadn't released just a couple of weeks ago. Add to that, the post end-credit scene suggests that the fifth Pirates of the Carribean movie may not be the final one after all. I don't know about you, but I am seasick of it all.